A detailed molecular-level understanding of the excited-state (ES) decay dynamics of transition metal complexes (TMCs) is vital to develop the next generation of light-active components in a wide variety of applications related to photochemistry, including optoelectronics, photocatalysis, dye-sensitized solar cells, artificial photosynthesis, photonics sensors and switches, and bioimaging. After photoexcitation, TMCs can undergo a plethora of interconnected relaxation processes, which compete to each other and are controlled by the subtle interplay of electronic and geometrical rearrangements that take place during the ES deactivation dynamics at different timescales. Intrinsic factors such as (i) the spin and character of the electronically ES involved in the process and (ii) the energetic alignment and effective couplings between these states do play a protagonist role in determining the preferred deactivation channels. Extrinsic factors, such as temperature, pressure, excitation wavelength, and environmental effects, can often strongly modify the outcome of the photochemical processes. As kinetic control is always at play, only the fastest processes among all possible deactivation channels are generally observed. Due to their high density of ES of various characters, TMCs usually display rich and chameleonic ES and photochemical properties. Computational chemistry is a powerful and unique tool to provide a microscopic and time-resolved description of these complex processes, and it often constitutes the fundamental ingredient for the interpretation of time-resolved absorption and emission spectroscopic measurements. 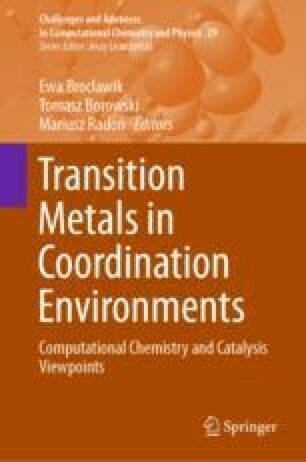 This chapter provides first a general overview on this complex topic, followed by an overview of the state-of-the-art quantum chemical and reaction dynamics methods to study the photodeactivation dynamics of TMCs and finally illustrates the progress and challenges in this field with recent examples from the literature. Importantly, these examples cover the ultrafast ES decay regime but also the long-lived photodeactivation from thermally equilibrated ES.